An alpine butterfly knot with a carabiner. Used by climbers and mountaineers. Can be used to isolate a worn section of rope. The Butterfly Loop, also known as the Lineman's Loop or alpine butterfly loop, is a "non-jamming loop on the bight", a loop which may be tied in a rope with two fixed ends, and can take loads on both ends of the original rope, and on the loop. The alpine butterfly loop is a symmetrical and more secure version of the butterfly loop. Tying an alpine butterfly on the bight. 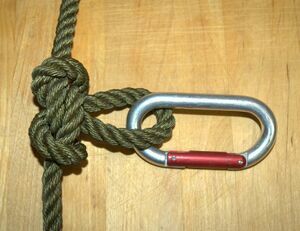 The Butterfly Loop has a high breaking strength and is regarded by mountaineers as one of the strongest knots to attach climbers to the middle of a rope, such that they have room to move around even when the main rope goes tight, and they can be supported in either direction from the main rope. The loop is typically attached to a climbing harness by carabiner. It can also be used to isolate a worn section of rope, where the knot is tied such that the worn section is used for the centre of the loop. This page was last edited on 21 August 2007, at 14:05.